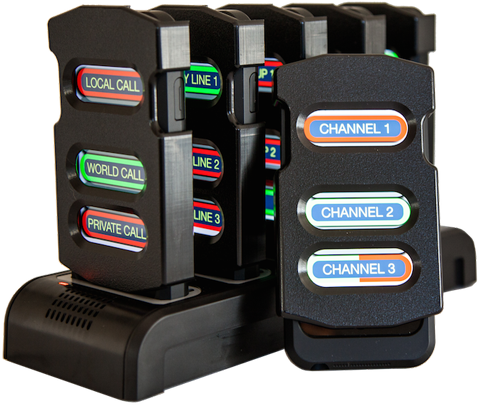 iPak turns the familiar Apple iPod Touch or iPhone into the ultimate wireless beltpack intercom system by integrating an extended life battery case, SmartTouch™ slip-over cover, and belt clip. Single and 5-Bay drop-in charging stations are also available. While traditional systems use the increasingly congested RF (Radio Frequency) and distance limited wireless spectrum, iPak allows communications over standard WiFi, 3G, 4G with no distance limitations between devices and no complicated RF antenna set-up. iPak utilizes the standard VCOM User Interface for iOS and can run on either a private LAN/WAN or cloud-based VCOM server. iPak allows for a virtually unlimited number of users and channels, and with flexible button programmability iPak can meet the most demanding wireless communications requirements.